Gaven Industries' Interior Pneumatic Air Seal R.F. 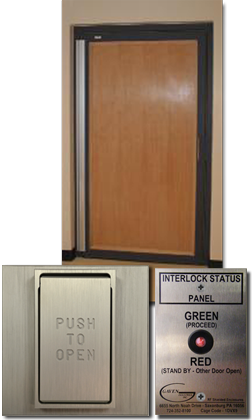 Shielded Doors are lightweight, easy to operate and require very little maintenance. 304 Stainless Steel is used throughout the construction of the frame and door leaf and all seams are fully welded. Unlike competitors aluminum or brass doors, the 304 stainless is highly corrosive resistant and can be cleaned with normal cleaning products! The 'Zero Friction' opening and closing force design makes them as easy to operate as any standard commercial door, and with minimal maintenance, will continue to operate as designed for decades. Advanced machining techniques are used to assure proper and continuous alignment of the door leaf and frame. It comes standard with a Heavy Duty Roton Hinge that will last for the life of the installation, two stainless steel pull handles, and two door mounted 'Push to Open' switches. Doors can be electrically controlled to allow simple integration into a building's security system and/or interlocked with other doors or systems. Additional options are available such as an automatic operator, magnetic locks and deadbolts. Gaven Industries' Pneumatic Doors exhibit the highest R.F. shielding performance in the industry. They are widely used in secure research facilities world wide. 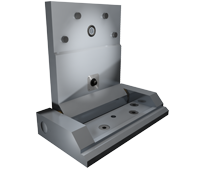 They can be manufactured to any size and in any configuration (i.e. single, double, uneven double). The door leaf(s) can be finished with any commercially available wood veneer species or plastic laminate. 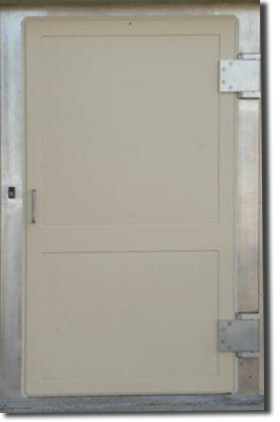 Gaven Industries Inc Exterior Air Seal Doors for HEMP Shielded Enclosures are the most reliable and easiest to operate doors available today. 304 Stainless Steel is used throughout with no ferrous materials being used in the construction of the Air Seal Door or its hardware. Their 'Zero Friction' opening and closing force design makes them as easy to operate as any standard commercial door. With minimal maintenance, the door will continue to operate as designed for decades. Advanced machining techniques are used to assure proper and continuous alignment of the door leaf and frame. This Patent Pending design eliminates any inflating of air seals when the door is open. Gaven's STC 50+ door is the only industry patented Sound Attenuating R.F. Shielded Air Door of its type. Noted for its "ease of assembly", Gaven's STC 50+ door is unique in its construction and design. Employing a "double leaf / double frame" system, the STC 50+ acts as one integrated door. Gaven Industries' Sound Attenuating R.F.Shielded Doors are made entirely of 304 Stainless Steel with all joints fully welded. They are easy to operate and are electrically controlled to allow simple integration into the buildings security system and / or interlock with other systems. Additional options are available such as an automatic operator, magnetic locks and deadbolts. Gaven Industries' Wide Knife Edge Door is the only knife edge door of its kind. Its design and manufacturing is exclusive to Gaven, and truly brings the design of a "knife edge" door forward into the 21st century. Unlike the extruded brass commonly used in "knife edge" doors, the 304 stainless steel used throughout the construction is not subject to wear and corrosion due to everyday use. Wide Knife Edge Door frames can be configured for installation into any shielded Enclosure. 1-1/4" Channel allows for easy access to fingerstock for cleaning and repair. Gaven Industries' Wide Knife Edge Door meets all requirements of MIL-STD-188 - 125 -1 and 2, NSA 94-106 and the more stringent NSA 65-5.